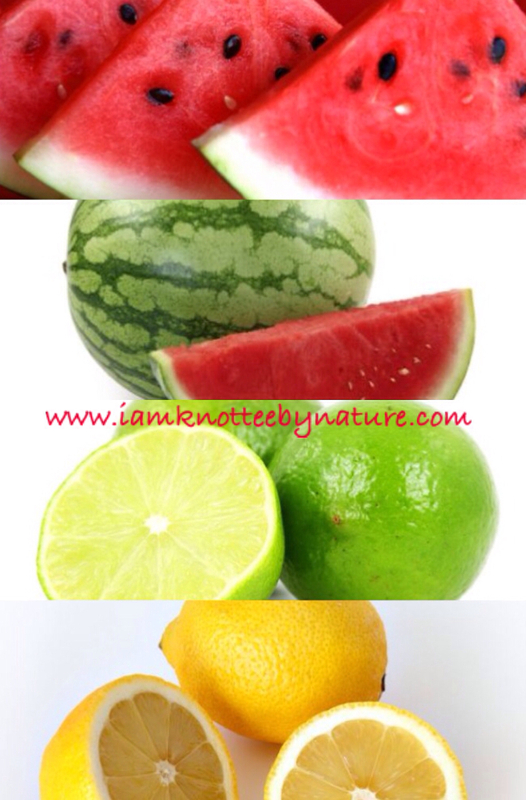 Today’s post we’ll be looking at the fruits- Watermelon (yup! you guessed right…lol) and Lemon …you’ll be amazed at how beneficial they are to your hair and your wellbeing…. Shall we? The very large, extra juicy fruit- Watermelon is a rich source of Antioxidants and contains Vitamins A, B1, B6 and C. It’s a fruit that contains balanced nutrients as it also contains Protein, Carbohydrates, Magnesium, Potassium and Fiber; all these play an important role in making your hair long and lustrous. It hydrates and moisturizes your body and skin; helps remove excess oil from skin and treats sunburns. Apparently, it’s one of the recommended fruits for hot areas, like where I live and also durig during the summer! It contains an Amino acid called Arginine (which by the way acts as a natural Viagra-preventing and treating erectile dysfunctions) which improves blood circulation in the scalp-keeping blood pumping to your scalp, thereby promoting hair growth!!! It also helps prevent hair loss(Recipe below)..
Did you know that If you have problem sleeping, eating watermelon can help because it helps increase the level of Serotonin which helps improve sleeping by making your brain less sensitive to noise? It contains Citrulline which makes cells produce less fat, preventing over accumulation of body fat. Eating W’melons also prevents dehydration and night blindness (vit. A). Apply the white part peels all over hair and allow to dry. Then rinse with water. Oil extracts from the seed can be used as a good moisturizer because the texture is extremely light. Lemons the very opposite of W’melons in size, are smallish in nature. Very rich in Vitamin C which is necessary for hair growth, it also contains Citric acid, Flavanoids, Calcium,Pectin and Magnesium. They help in weight loss when you drink its juice. Product Build up: Soak hair in lemon juice mixed with water, then rinse off. 1 raw egg…. Apply on hair, leave for a few minutes, then wash out with Sulfate free mild Shampoo. Hair Loss: Mix Lemon juice with Coconut water. Apply on hair and leave for about 20mins. Rinse out with water. Hair Growth: Mix lemon juice with coconut oil. Apply on hair and rinse off after a few minutes. Dandruff: Rub it on scalp, leave for few minutes and wash out with water. Strong, Shiny Hair: Mix Lemon juice, Henna and Egg yolk. Apply on hair and leave to dry for about 2hrs. Wash with lukewarm water. Previous Previous post: A “Fruit”ful Hair….Literally!! !